After adjusting for inflation, Minnesota farms earned the lowest median farm income in the past 23 years of data tracked by University of Minnesota Extension and Agricultural Centers of Excellence within Minnesota State. In 2018, the reported median net income was $26,055, down 8 percent from the previous year. Farmers in the lowest 20 percent reported losing nearly $72,000. The analysis examined data from 2,209 participants in farm business management programs, as well as 101 members of the Southwest Minnesota Farm Business Management Association. This is a collaborative project with the FINPACK Team and the Center for Farm Financial Management (CFFM). 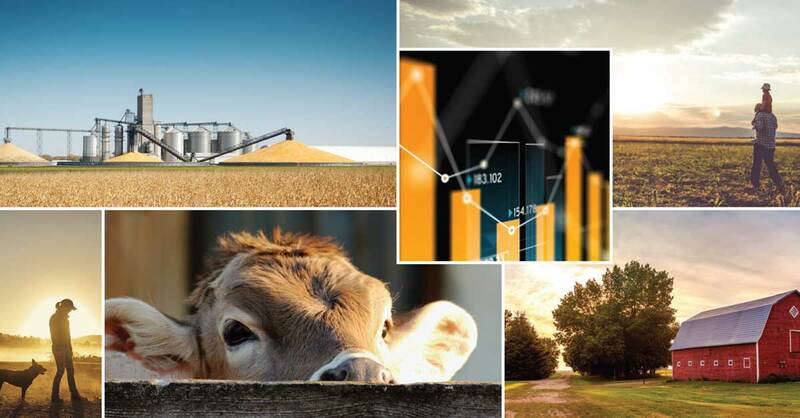 Farmers struggled with low prices and low profitability in 2018. Participating producers represent approximately 10 percent of Minnesota’s commercial farmers. Notably, the number of participating dairy farms decreased by 15 percent in 2018, largely reflecting the number of participating dairies that sold their herds. 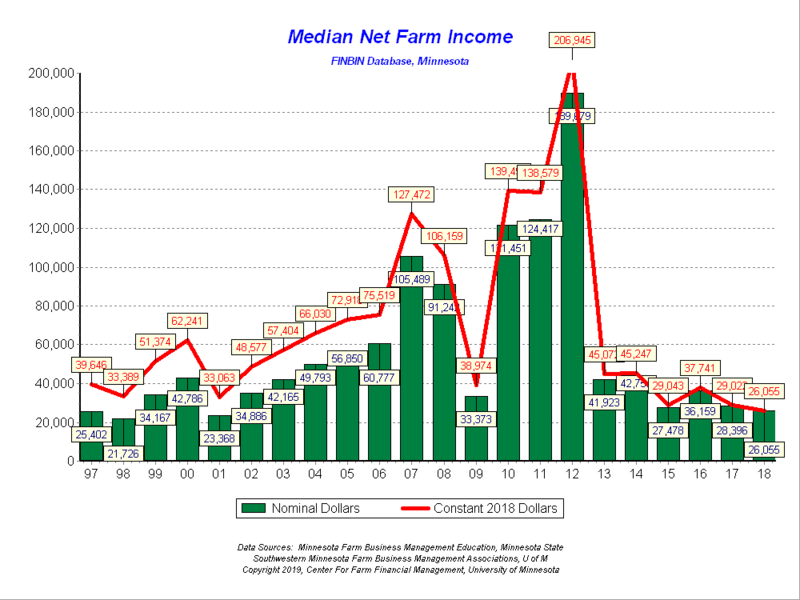 Lowest Median Net Farm Income for MN Farms in Over 20 Years. The economic pain was widespread. The median producer in all four of Minnesota’s primary agricultural products earned a net farm income of less than $31,000. “It’s important to understand that these are small businesses that don’t pay themselves a salary, so that net farm income reflects what they made from the farm to feed their families,” added Nordquist, who is also an Extension ag economist. On a more positive note, farm balance sheets did not deteriorate substantially from previous years. The average farm’s debt-to-asset ratio increased slightly to 36 percent, still a relatively strong financial position largely supported by farmland that has maintained its value. When non-farm earnings are added to the picture, the average farm family’s net worth increased by almost $30,000. Dairy farms have been particularly hard hit by low prices in recent years. Over-production and trade issues have weighed on milk prices causing many dairy farms to sell their herds. In 2018, the median dairy farm in these farm management programs earned less than $15,000, down from $43,000 in 2017. Milk prices were down 7 percent in 2018—and down 33 percent from their highs in 2014. In 2017, the pork industry was the one bright spot in Minnesota agriculture. But in 2018 the median pork producer earned only $27,739, down from over $101,000 in the previous year. Pork prices were down 9 percent, again largely impacted by trade issues. The average hog finisher lost $11.50 per head sent to market. Low profits continued for beef producers. The median beef participating beef farm earned just over $6,000, virtually unchanged from the very low profitability of the previous year. Beef finishers lost almost $30 per head marketed. Crop farmers struggled with weather, prices and trade issues in 2018. The median crop producer earned $30,650 in 2018, a slight increase from the previous year but still historically low earnings. Southern Minnesota producers especially struggled to get their crops in with persistent spring rains; local spring flooding forced many to replant fields more than once. Corn production was hit especially hard, with average corn yields down 20 percent across the southern part of the state. Yields were higher in the Red River Valley. Low prices persisted for all major crops. Soybean prices especially were impacted by trade issues. “It could have been a lot worse,” said Aaron Brudelie, a Minnesota West Community and Technical College farm business instructor. “The federal Market Facilitation Program was the main reason soybean producers showed any profits this year. Producers are using those profits to help offset another year of losses in corn production in southern Minnesota.” USDA’s Market Facilitation Program provided direct payments to producers of certain commodities that were impacted by retaliatory tariffs by foreign countries. The statewide results are compiled by the CFFM into the FINBIN database, which can be queried at www.finbin.umn.edu. FINBIN is one of the largest and most accessible sources of farm financial and production benchmark information in the world. FINBIN places detailed reports on whole farm, crop, and livestock financials at your fingertips. 2018 data will continue to be added this spring from other collaborating states, including Illinois, Michigan, Missouri, Nebraska, North Dakota, Ohio, South Carolina, South Dakota, Utah, and Wisconsin.